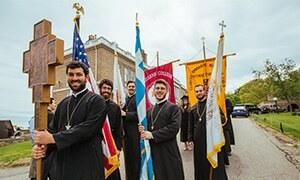 The Office of Vocation & Ministry (OVM) seeks to be theologically and faithfully Orthodox Christian; to be excellent stewards of the resources of the visionary philanthropists and foundations who support our ministry; to work with integrity, energy and creativity; to provide engaging and rich programs through effective administration; to publish resources to share learning; and to utilize collaborative inquiry for ongoing program planning and evaluation. In May 2008, the Lilly Endowment awarded the OVM an additional three-year matching grant to help the programs transition from being fully funded by the Endowment to fully funded by the community. While the OVM began through a generous grant from Lilly, the Endowment believes that its grantees must, through broad-based community initiative, support their new programs. The OVM fulfilled this matching grant challenge through the generous support of the Archbishop Iakovos Leadership 100 Endowment Fund, Old Neighborhood Foods, the Virginia H. Farah Foundation, the Gerondelis Foundation, and several individual benefactors. Since 2012, the OVM has received all of its support for its college and high school programming from visionary donors, philanthropists, foundations, friends, and the alumni of our programs. In 2016 it received a five-year visionary grant from the Lilly Endowment to expand its reach to young adults ages 23-29 through the Telos Project. We are profoundly grateful for the opportunity to partner all of our foundations, philanthropists, and donors to offer vital vocation and leadership training to tomorrow’s leaders for Church and society—today. The Nicholas J. and Anna K. Bouras Foundation, Inc.